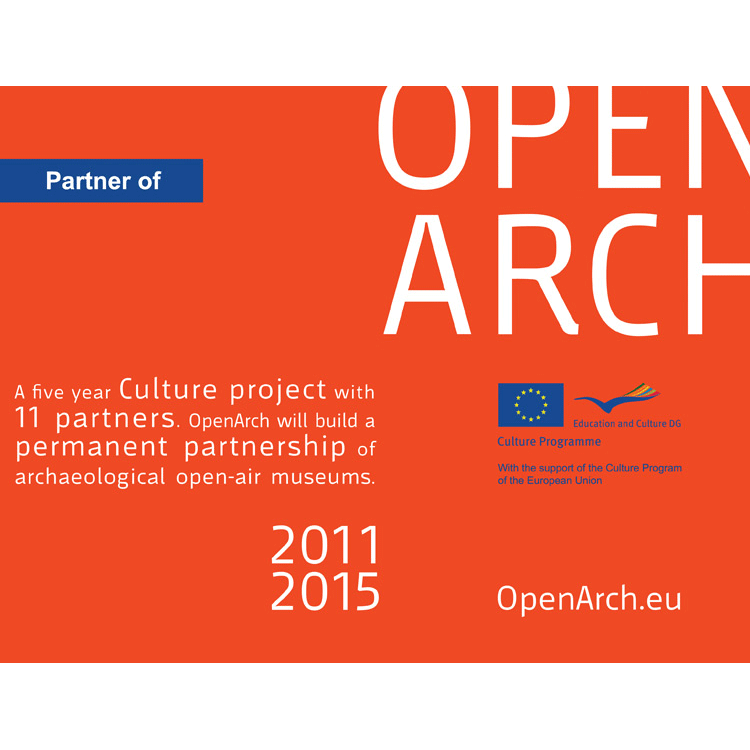 OpenArch was a EU Culture Project, including 11 partners. We made 30 products during the five years this project was running, from a simple advert up to a huge website. 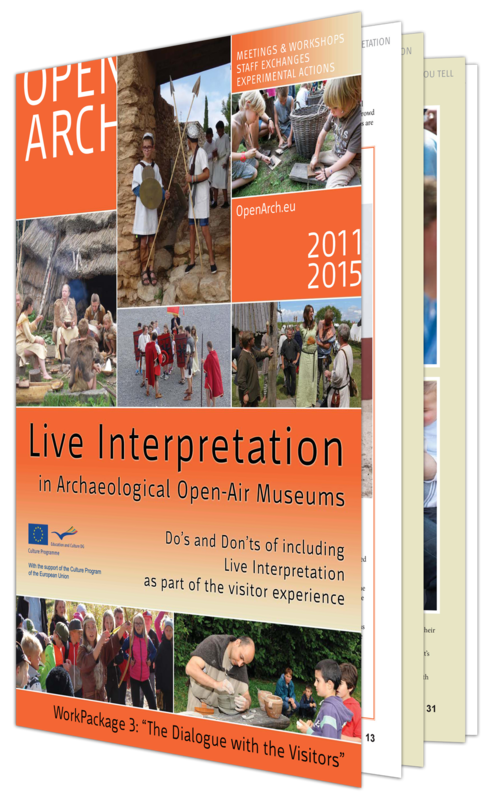 2015: two Brochures - Booklet about Archaeological Open-Air Museums and Museum Organizations and Booklet about Live Interpretation in Archaeological Open-Air Museums. 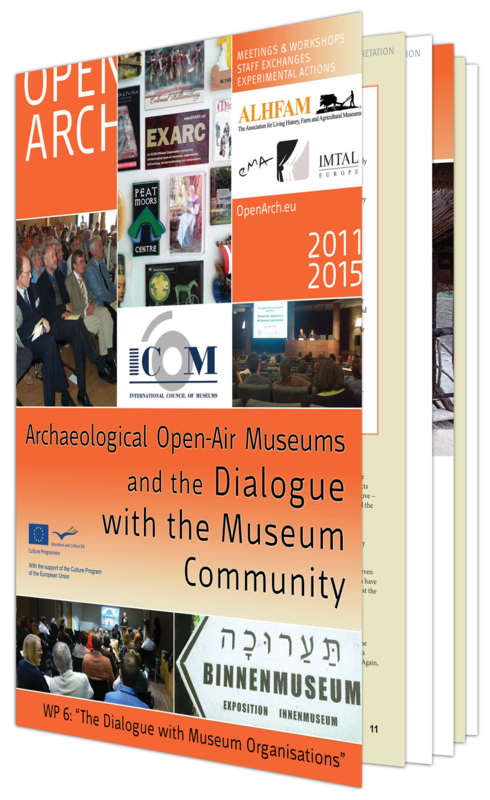 Both of them are A4, counting 44 pages, full colour, made all in the style of OpenArch (similar to the PR booklet). The booklets are printed in 150 copies. 2014-2015: Three DVD Cover and label: We made a design based on previous OpenArch designs, using stills from the films and including all other important information. We prepared the designs for Kierikki (FI), Calafell (ES) and Parco Montale (IT). 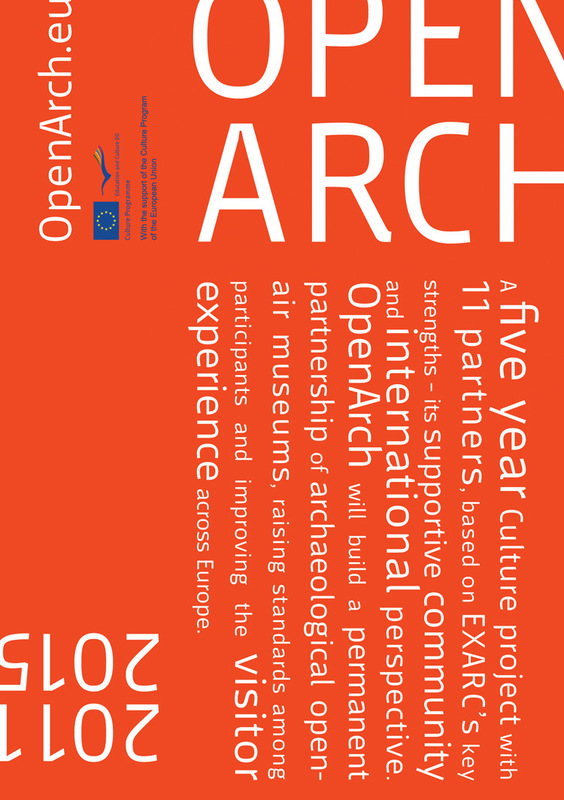 2013 - 2014: A board (120 x 70 cm) about OpenArch and its partners. 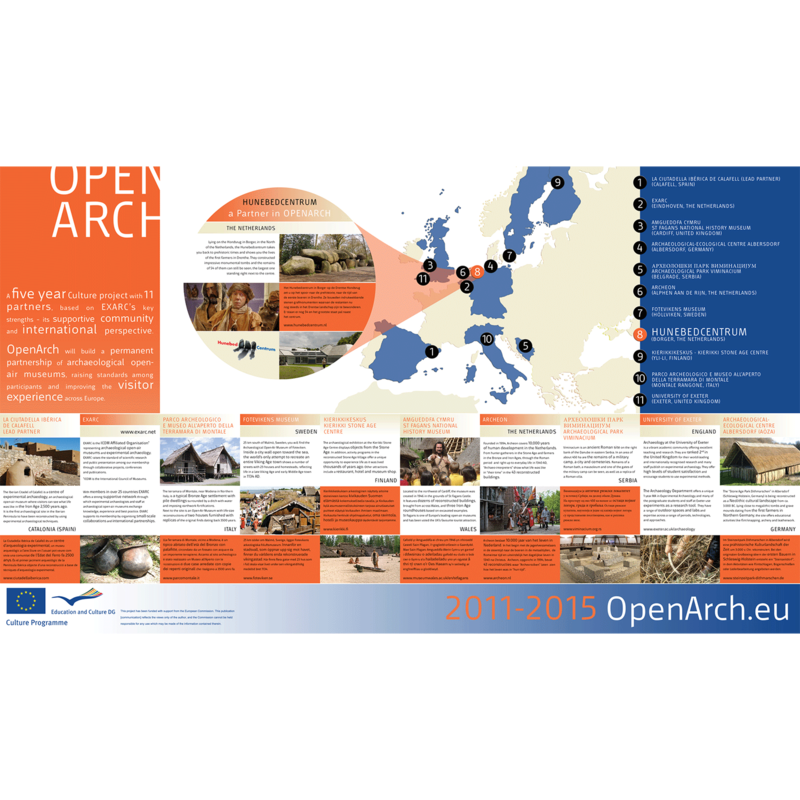 The board contains general information on OpenArch, about all 11 partners, of course with special attention to the partner where the board is placed. 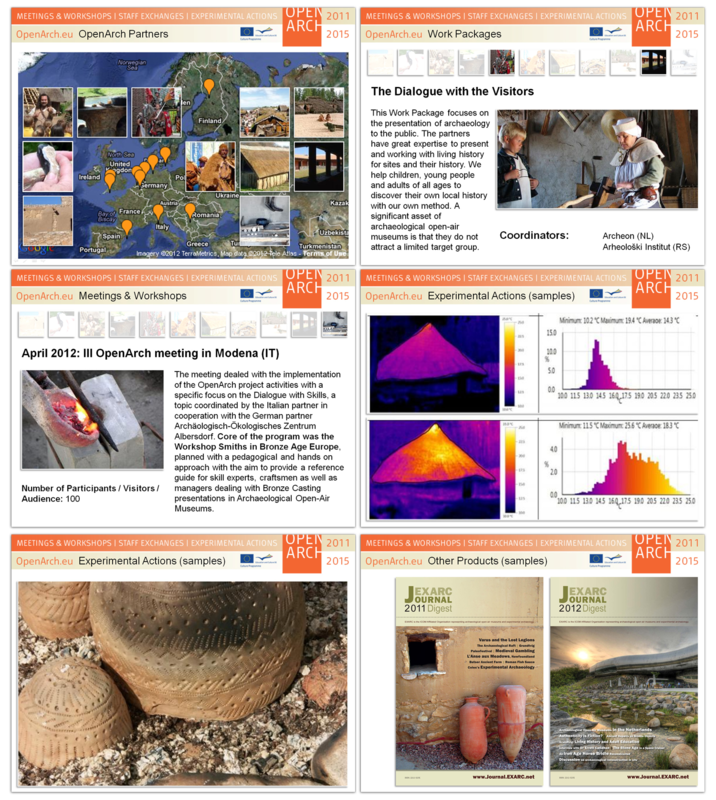 We made four boards for Archeon (NL), Hunebedcentrum (NL), AÖZA (DE) and Calafell (ES). 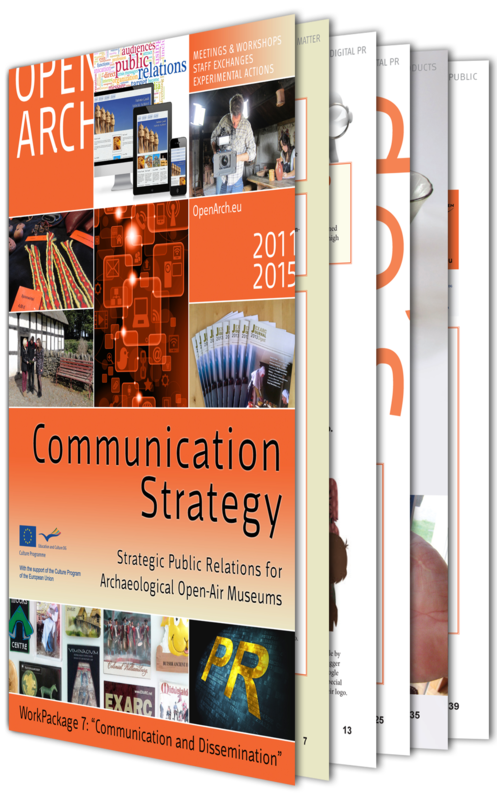 2012: we prepared Stationary and PowerPoint Templates for OpenArch partners (for each Partner and theme) and some printed products including a folder (Trifold) on A5 size when folded. The folder holds all 11 partners, and explains about each of them. Printed in full color, a circulation of 5,000 copies, on 170-gr paper. Additionally several flyers were made about each partner to use as insert or independent, all in native language and English. Also samples adverts in different size and proportions were made to use by partners. 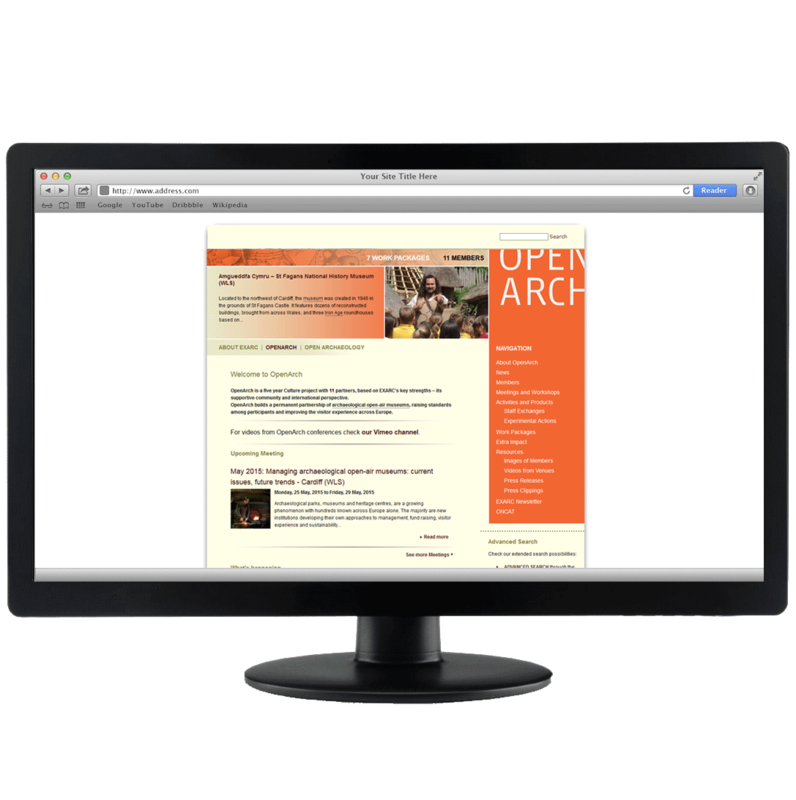 OpenArch project website. 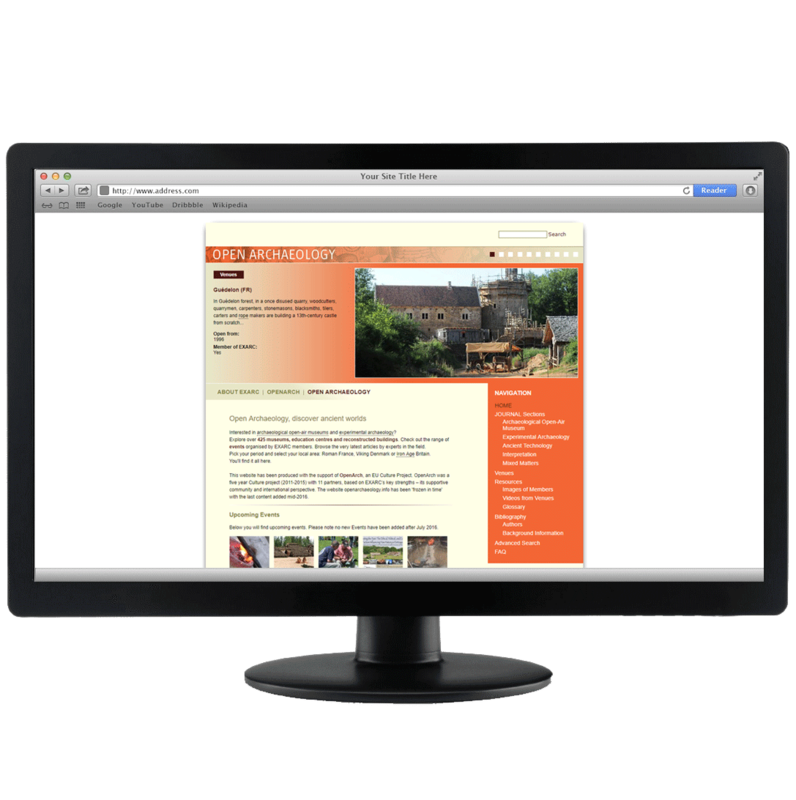 Mohini Vision created an internet presence, planned to survive the OpenArch project. 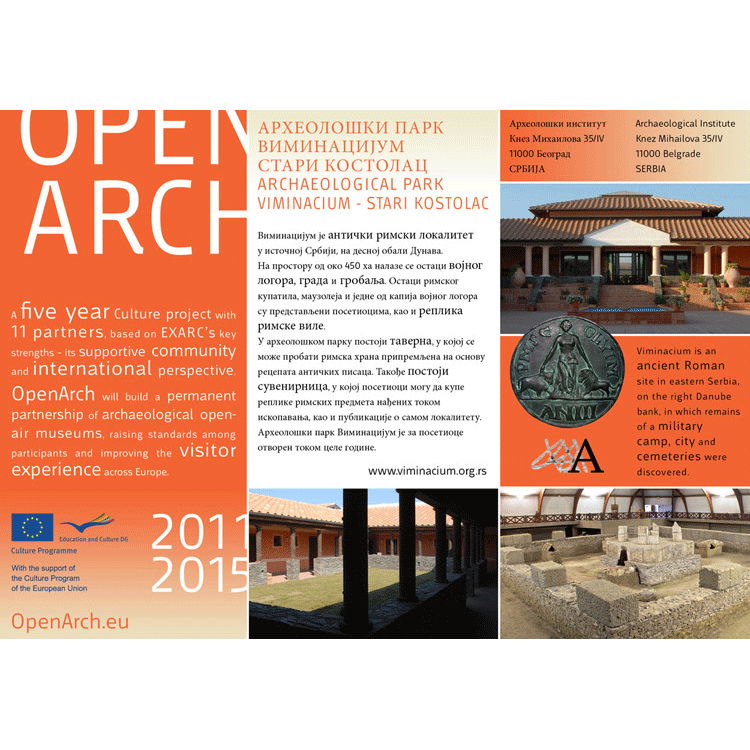 See http://openarch.eu/. Made in Drupal. 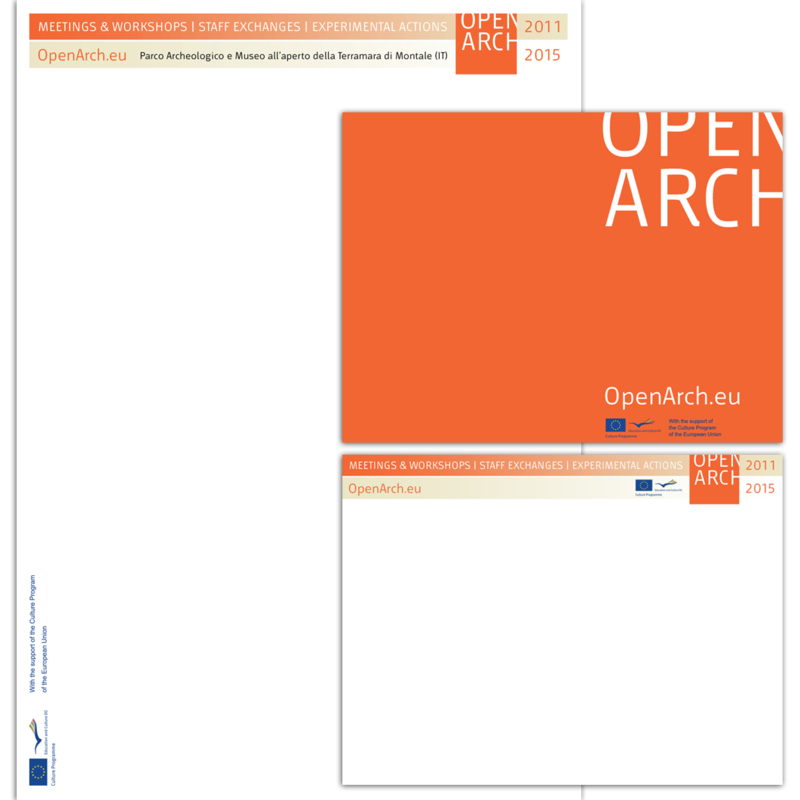 This website includes general information on OpenArch, explanations on the Work Packages, a presentation of all OpenArch members, a relevant news section, presentations of the meetings (including a schedule and registration forms). 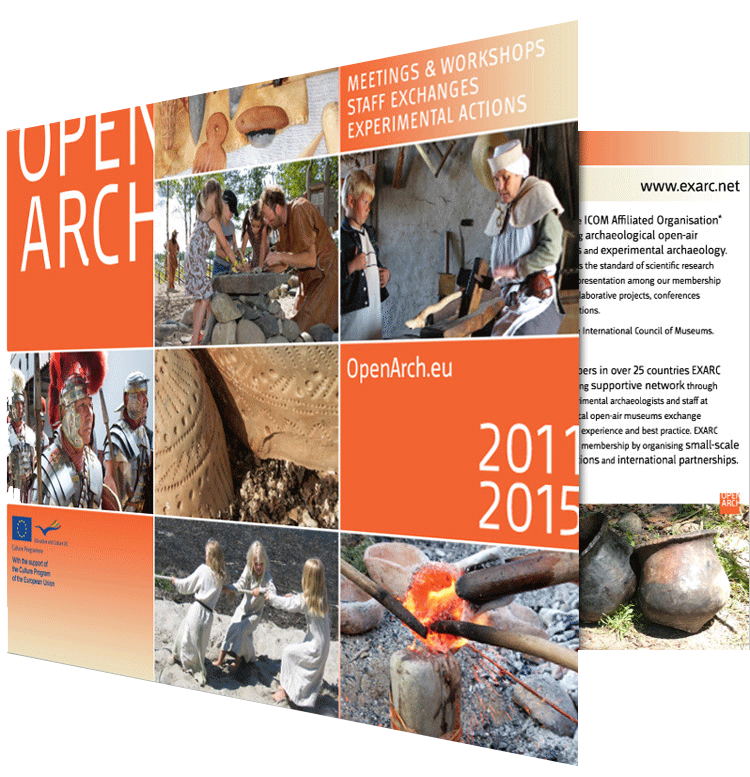 2011: For OpenArch we designed shields, flyers and roll-up banners. With just a logo and a handful of words we had to be creative and playful when designing. The shields (we printed 12) were 26 x 20 cm, flyers on A5 size (148 x 210 mm), full color offset, 4/0, at 170 grams paper and two roll-up banners (85 x 200 cm) to use at conferences. 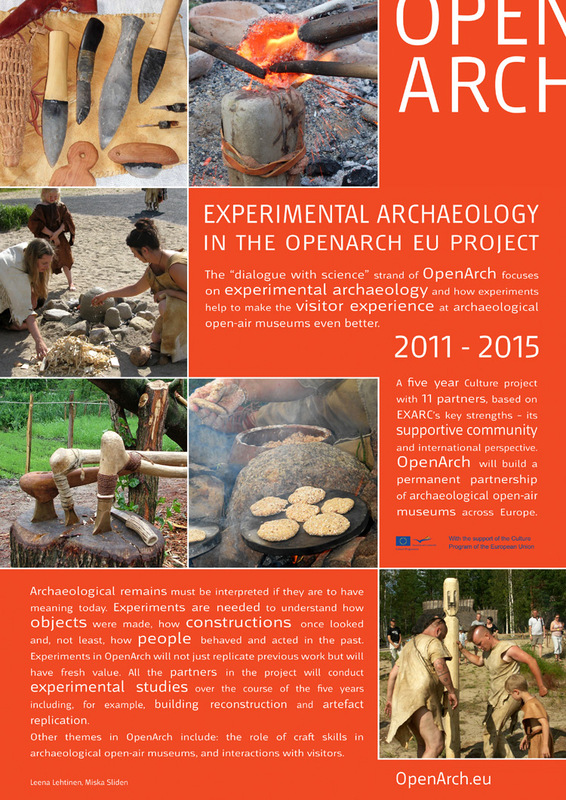 We also prepared a poster about Experimental Archaeology. 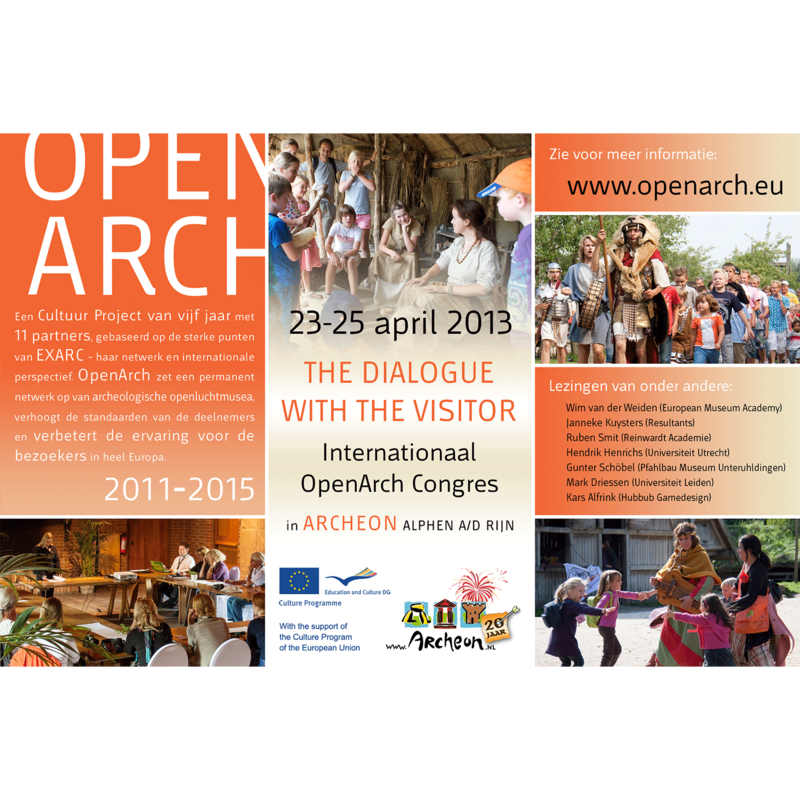 This poster was to start a trend in OpenArch which can be used by any of the seven Work Packages. It is size A1 and printed in full color.